Guys, I am SO darn excited to share these White Bean and Avocado Baked Burritos with you today. I teased you with them a couple of days ago on Instagram and Facebook and have been itching to post them here on Ceara’s Kitchen since. I don’t mean to toot my own horn or anything but these White Bean and Avocado Baked Burritos are darn good. I usually eat avocado cold (like in guacamole) but warm avocado is where it is AT y’all. 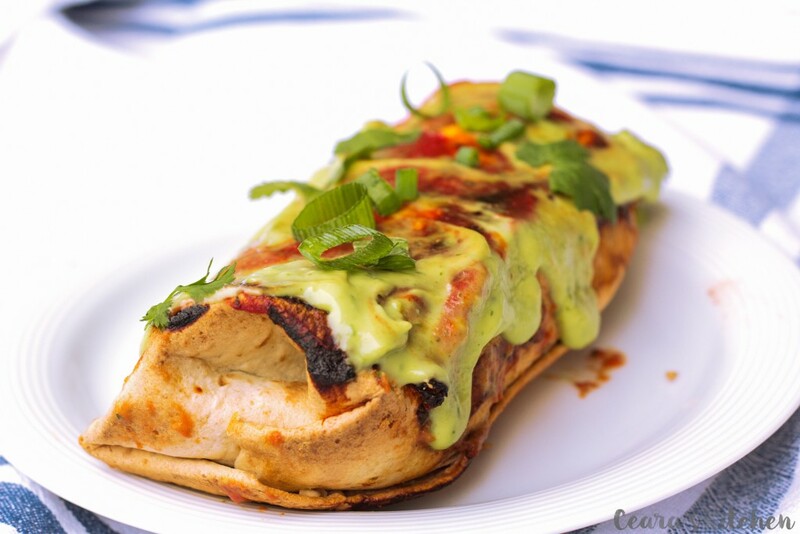 These Vegan Baked Burritos are stuffed with a hearty bean, mushroom and corn filling PLUS chopped avocado and cilantro. They are then wrapped tightly, snuggled up beside each other in the casserole dish and smothered in tomato sauce. Fresh from the oven, my partner J (who hardly swears!) took one bite of these White Bean and Avocado Baked Burritos and said “Holy S)@!” these are good. And if there wasn’t enough avocado stuffed inside these Baked Burritos, I smothered them with my Creamy Zesty Avocado Lime Dressing. If you are using the dressing on top (which I’d definitively recommend), make sure to add a couple extra tablespoons of water to the dressing so you can easily pour it over freshly baked burritos straight out of the oven. 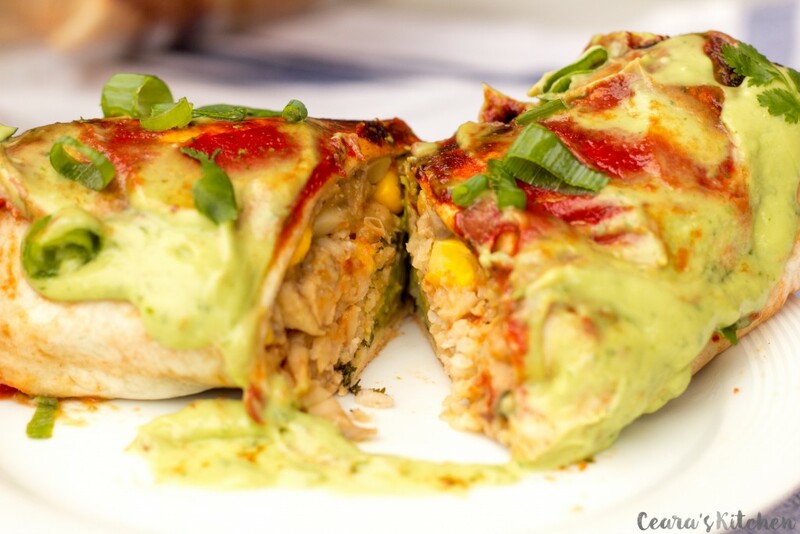 These White Bean and Avocado Baked Burritos make the perfect dinner – stuffed with white beans, mushrooms, corn + lots of avocado! This recipe makes enough for a family of 4 and for lunch the next day. Feel free to half the recipe if you are serving this to a smaller crowd. [b]Preheat:[/b] Oven to 350F/180C. Lightly spray two casserole dishes (9×13 and 8×8 – or whatever large casserole dishes you have on hand) with a bit of oil (so the burritos don’t stick to the pan when baking) OR line the casserole dishes with parchment paper. [b]Rice:[/b] Prepare the rice while making the burrito filling. Boil and simmer the brown rice and vegetable bouillon in water 1 3/4 cup water (you might need to use a bit more or less water depending on the brown rice you use). [b]Burrito Filling:[/b] In a large pot, over medium-high heat, saute the garlic and onions with cumin in a couple splashes of vegetable broth for a couple of minutes. Add the mushrooms and peppers (seeds in the jalapenos if you like it spicy!). Saute for 5-7 minutes until the mushrooms and peppers are lightly cooked. Add splashes of vegetable broth when necessary so the vegetables don’t stick to the pan. Turn off the heat and blend 1/3 of the mixture. Stir in the corn. [b]Tomato Sauce: [/b]Stir together tomato sauce, garlic powder, cane sugar, cumin and fresh cilantro. [b]Assemble the Burritos:[/b] Lay the tortilla wrap on a plate. Stuff with 1/2 cup of the Burrito Filling, 1/4 heaping cup of brown rice, a small handful of chopped avocado and a few pieces of cilantro. Roll the tortillas and place them in the casserole dish [b]seam down[/b]. Continue filling, rolling and placing the tortillas in the pan until all the tortilla wraps are used up. They can be tightly squeezed together in the pan (see photo). Use any additional rice and bean mixture for a salad the next day. Cover with the tomato sauce mixture. [b]Bake:[/b] Bake for 25 minutes uncovered. 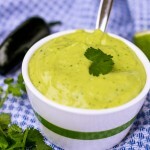 Garnish with [url href=”https://www.cearaskitchen.com/zesty-avocado-lime-dressing/” target=”_blank”]Creamy Zesty Avocado Lime Dressing[/url], fresh cilantro and green onion. 1) Use 2 jalapeno peppers (some seeds left in) if you want these burritos spicier. I use one jalapeno (seeds out) when making this for family. [br]2) I like this recipe with nutritional yeast because it gives the filling a “cheesy” taste. Leave it out if you do not desire a cheesy taste[br]3) Use gluten free tortilla wraps if you need this recipe to be gluten free. [br]4) To keep this recipe oil-free, line the casserole dish with parchment paper. Can these be made and frozen and sauced later before baking? I just found this rceipe and shared on FB, which I usually don’t do, It is Just. That. Good. Especially the lime avo dressing, which I can see becoming a staple salad dressing or veg dip, too. The flavorprofile is really good – balanced and NOT hot, despite adding hot peppers with seeds. I didn’t really measure some of the seasoning accurately because I know I like extra onion, cilantro and cumin (your mileage may vary), but other than that kept to the recipe quantities. It does make a lot of food, but if you like to cook once or twice a week and eat leftovers, it’s perfect. The prepwork is average for the volume of food produced, and the total amount is correctly portioned. I did measure the burrito filling with cups and it fit exactly 12 flour burrito wraps. Thanks for a reliable and delicious recipe! Ceara the instructions are unnecessarily convoluted. This also makes so much food. And it took about 2 hours with my husband helping me. I’m trying to be a kind person so I will leave it at that. It tastes fine but is not worth all the effort and prep. Do you have calorie count on these? I haven’t tried them yet, they are actually in the oven, right now. Hi Ceara! Looking forward to making these. For the peppers, do we choose either red or yellow or green or all 3? Thanks! I would love to be able to put this on Pinterest. I have a board where I keep my recipes. Is there a way to do that with this recipe? Whoops! I figured it out! Looks wonderful! Very excited to try this. My only question and the one thing that’s making me hesitant, is the blending part. I’ve seen the question asked but haven’t gotten the answer yet. Do you actually blend it in a blender? Sorry if that’s an odd question. Thanks!! Can’t wait to hear back and start making these. Yes, I blended 1/3 of the burrito filling in my blender, then added it back to the rest of the filling. It makes the texture of the filling a little more smooth, almost like a refried bean consistency. We really liked it! Will totally make again. Getting this ready to make tomorrow night. I do not see how much corn I am supposed to add? Could you let me know, if not I will just add a cup or so…thanks. The mistake I made with this recipe is I halved it…. I wish I had made the whole thing for more leftovers. That’s OK, I’ll be making it again and again. Everyone loved it, even the omnivores. I actually put some meat in my husband’s, as I usually do, but he said “you can leave the meat out of this one. It’s good as it is”. SCORE!! How many calories in a serving? How much protein per serving? Hi there! Your ingredients call for peppers… but for the life of me I can’t find where you mention the use of them?! HALP! Thank you so much! 🙂 Trying this tonight! Made this tonight for my family of 8 and it was a flop. I think it was the combination of the tomato sauce and cumin. It tasted like pool water to me and I am not a picky eater and have been eating vegan for awhile. It was rather labor intensive also so it made it all the more disappointing that none of us liked it. The avocado sauce was yummy though! That’s so strange, Jen. How did the sauce taste like pool water? Did you use plain tomato sauce? It should create an “enchilada” type sauce that the burritos are baked in. Glad you enjoyed the avocado sauce! My guess for Jen is that the “pool water” taste was from cilantro. People either love it or hate it. I always leave it on the side for recipes where it is called for, so people can add it if desired. Personally, I love it! I loved the burritos, but was not a fan of the tomato sauce. I’m honestly not sure what purpose it served but to make the burritos soggy. Also it did not taste very Mexican to me, even after I increased the cumin levels in it. I will definitely make these burritos again, but I will not make the tomato sauce. Also without the sauce they will come out of the oven nice and crispy kind of like a chimichanga. I made these last night with your suggested avocado dressing and it was SO VERY GOOD. My whole family loved it (ages 3 to 10 and adults) and they want it in our regular meal rotation. On the one hand, it does take more effort, but on the other hand, THEY ARE WORTH IT. Have you ever tried freezing these? The recipe makes a lot so I would love to make-a-pan-freeze-a-pan while I’m already putting in the effort. Thank you for making it more delicious for us to go plant-based. 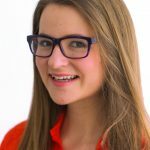 I really appreciate your blog. And yes, the burritos freeze really well. Leave them to cool, cover the whole batch and freeze or wrap the burritos individually and freeze for easy individual lunches. I have made this quite a few times. I make numerous changes to the recipe and it still comes out delicious. I turn them into more of an enchilada dinner and leave out the rice and corn. It still taste amazing! It is A LOT of food so as she suggested, you might want to half it. Hi I am making these for company and wonder if they can be made ahead of time? Such an amazing recipe! My husband gave it a two thumbs up and I cooked rotini pasta and mixed it with the left over beans. That was yummy as well! Thank you for sharing this delightful recipe !! These look so great and after reading all the rave reviews I am definitely going to try them! I just have one question – am I right to assume you are using canned beans (not dried beans that you’ve cooked first)? I don’t like mushrooms. What can O use in place of seven cups of mushrooms. Thanks. Hi Kathleen! The mushrooms are what makes this recipe “meaty” in texture. You could try replacing the mushrooms with maybe cauliflower or a combo of your favorite veggies of choice (i.e. squash or zucchini). Let me know how it turns out! This has hesitant to try the recipe now. We hate mushrooms and my hubs hates cauliflower. So I am not sure what I could do. Add a second type of beans? Where do you find the zesty avocado lime dressing? I want to make these this week, they look SUPER delicious! These are delicious! I don’t normally leave a comment on a recipe but this one was worth it. I had to make a few minor adjustments due to what I had on hand but the result was (I’m sure) equally as good. Very tasty! If you did want to add cheese, at what point would you do that? While packing the burrito? Or sprinkle on top? I would add it while packing the burrito! I made these last night for me and my meat-eater boyfriend, they were sooo delicious! He was surprised how good they were being that they’re vegan burritos. I also made the Zesty Avocado Lime dressing and it was amazing! Definitely added something special to the burritos; I’ll probably make it every week for other purposes too. Thank you so much for sharing your recipes, I look forward to trying out more, and hopefully I’ll be able to turn my boyfriend vegan too lol. Is there nutritional information for these?? I made these with only 2 tablespoons cooked brown rice per burrito and using the nutritional yeast and plugged it into My Fitness Pal and according to that each burrito has 378 calories, 15 g fat, 53 g carbohydrate, 11 g fiber and 12 g protein. I used Great Value whole wheat tortillas and did not make the avocado sauce yet so that would add more. Hope that helps! This is on the menu for tomorrow. I was just wondering about the blending step. So I actually put 1/3 of the burrito mixture in a blender? Or what do you mean by blend 1/3 of the mixture? Sorry for the silly question, I’m sure it’s obvious to everyone but me!! Can’t wait to eat these tomorrow night! Did you ever get an answer? This recipe is actually very confusing unless you make a lot of assumptions. Let me know if you’re actually supposed to blend 1/3 of the filling. And also what you’re supposed to do with it.. I made these last night and they are the bomb!! So so delicious. The recipe makes a ton, I got two 8×13 trays of them, and I popped one in the freezer. I left out the jalapenos in the burritos for my kiddos sake, and then made the zesty avocado lime dressing a little extra zesty for hubs and me. These truly are to die for! SO happy you and your family enjoyed the burritos and zesty avocado lime dressing 🙂 Thank you for the lovely feedback! Hi, we always love burritos so I look forward to trying the recipe. Twice you mentioned tomato sauce, I wonder in the fulling do you use the recipe tomato sauce? But only 1/2 cup is used when the recipe of tomato sauce requires 3 cups of plain tomato sauce? 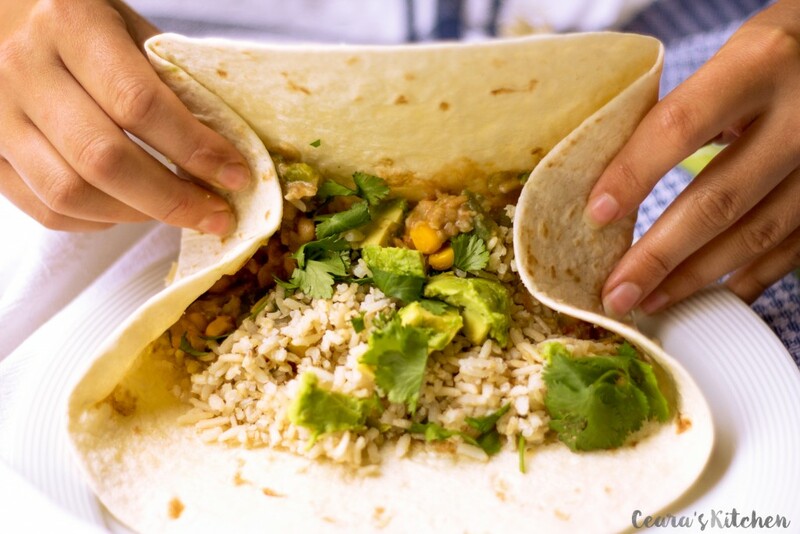 The picture looks like there is rice in the burrito, are those the chopped up mushrooms? I made this last week and it was very different and quite tasty! I was a bit dubious about how the mushrooms would feel/taste in the combination, but it works great. My husband (who is not vegan like me) said we definitely need to add this to the rotation. 🙂 I had to third the recipe since it’s just the two of us and even that was a very filling dinner AND lunch the next day. I used leftover rice I had in the fridge which made this super fast to put together. I upped the cilantro a bit since we love the stuff. So of course the Zesty Avocado Lime Dressing is what tipped it into AWESOME. I made enough of the dressing that we’ve been putting it on everything for days. lol Thanks so much! Thank you for the feedback, Samantha! Happy to hear you enjoyed the burritos and the dressing 🙂 We love smothering the dressing on everything as well!! I don’t mean to sound ignorant but in step 6 you state, “blend 1/3 of the mixture”. Are you referring to the tomato mixture? One third of the tomato mixture into the burrito filling, the rest spread over the top of the burritos? Thank you!!! Cant wait to make this! You blend 1/3 of the bean and veggie mixture (not the tomato mixture). This is the filling you put in your burritos. Like blend it up in a blender and mix back in with the veggie mix? The recipe does look mouth watering, but I can’t find what oven temperature is required once the burritos are assembled? Thanks. Oops, I’ve just spotted it, sorry! Please ignore! Ceara, I can totally see why this is your most popular recipe! It’s an amazing one! Love every single ingredient. Looks so darn filling and gorgeous! <3 Thank you so much girl! Do you know how well these would freeze? Seems like a great meal to eat fresh and then stick a couple extras in the freezer. I’m also thinking of subbing black beans for the white, as I don’t think I like white beans. ever tried salsa on top? No but that would be delicious 🙂 Let me know if you do! We loved these buritos. The flavors were great and the sauce on top made the dish. Thank you. Thank you for the lovely feedback!! 🙂 So happy you guys enjoyed the burritos! So happy you and your family enjoyed the burritos Michelle! 🙂 Thank you for the wonderful feedback! Oh my goodness! I’m drooling over here.. these look so amazing. The photos are awesome! These were a hit! My husband who is not the most effusive with praise for vegan cooking loved them. He really liked the avocado sauce. Holy cow. These look intensely good. And amazing. And I wish I could have these for lunch right now 🙂 Warm avocado sounds wonderful too. What a beautiful recipe, Ceara! So happy you enjoyed these baked burritos and that they’ll become a regular in your home, Gaynor!! 🙂 Thank you so much for taking the time to leave your wonderful feedback and sharing your awesome photo on Facebook! Your cashew-garlic sauce sounds DELISH! Hi, please share your cashew-garlic sauce recipe. I have not posted it yet but am working on one and will share when it’s online! These look delicious. I wonder if you could substitute zucchini or an orange squash for those of us who don’t like mushrooms? I think a mixture of squash and zucchini would be delicious in these!! 🙂 Let me know if you end up making them – I’d love to know the results! Holy moly Ceara! I’m drooling all over my keyboard! These look sooooo dang delicious….everything about them! 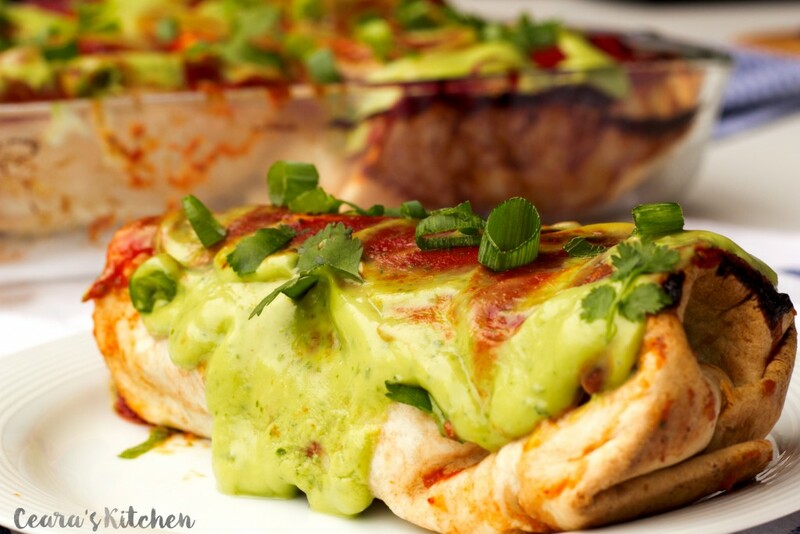 The pictures are beautiful and smothering them with the tomato sauce (just like enchiladas) and then the avocado sauce, just wow! 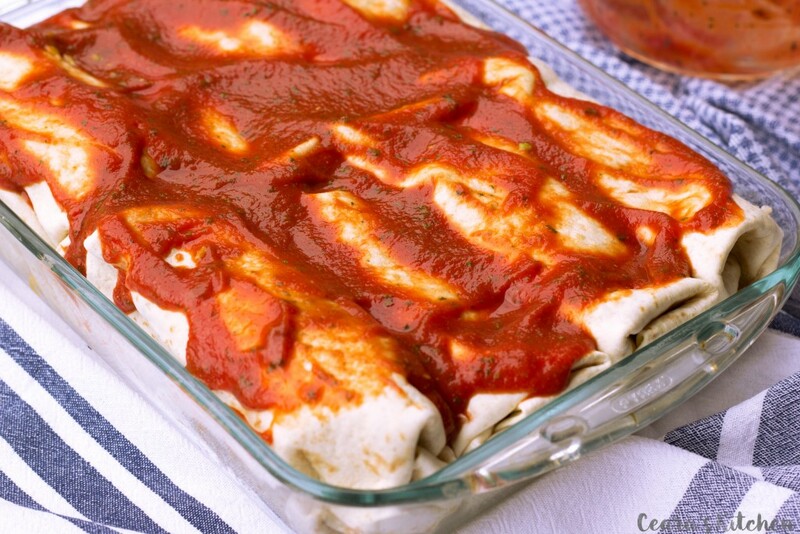 It’s like enchiladas, but with an Italian flare because of the tomato sauce on top! It’s the best of both worlds! Amazing recipe girl!! <3 Thank you, Natalie! This is definitively a very comforting meal! LOVE this! This is just the kind of meal my family DEVOURS! The flavors here are outstanding…and that sauce! Yum!! Yay for a Mexican recipe. The avocado looks delicious on this and just goes to show that you don’t need meat in Mexican food.